Thank you for the opportunity to appear before you today at this hearing on the Pros and Cons of Restricting Purchases in the Supplemental Nutrition Assistance Program (SNAP). My name is Diane Schanzenbach, I am Director of the Hamilton Project, an economic policy initiative at the Brookings Institution, where I am also a Senior Fellow in Economic Studies. I am also a Professor of Social Policy and Economics at Northwestern University. For the past two decades, I have conducted and published numerous peer-reviewed research studies and book chapters on the U.S. safety net, including SNAP and the Food Stamp Program. I also study childhood obesity, food consumption, and food insecurity. I recently served as a member of the Institute of Medicine’s Committee on Examination of the Adequacy of Food Resources and SNAP Allotments. My testimony today draws primarily from research that I have conducted or reviewed that considers the role of SNAP and other influences on food consumption and food insecurity. SNAP is a highly efficient and effective program. It lifted nearly 5 million people out of poverty in 2014 (the most recent data available).1 SNAP is targeted efficiently to families who need benefits the most, reduces the likelihood that families have trouble affording food, and serves as an automatic fiscal stabilizer in times of economic downturns.23It has extremely low rates of both error and fraud.45 SNAP also has long-term benefits to children. 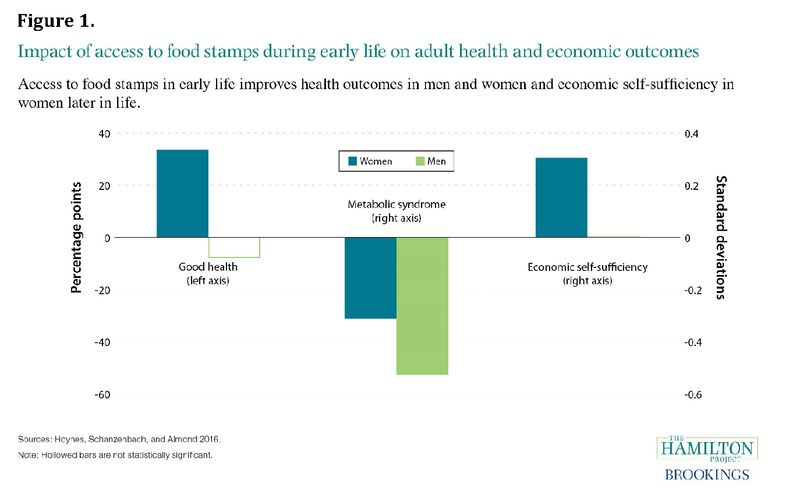 My own recent research study found that those who had access to SNAP benefits during childhood were more likely to graduate from high school, grew up to be healthier, and women in particular were more likely to become economically self-sufficient due to childhood access to SNAP benefits, as shown in Figure 1. Generally, economists advise policymakers not to interfere in the private market unless there is a compelling reason to do so—such as a market failure or another inefficiency that would be improved through government intervention. In the case of SNAP, the fundamental problem the program is meant to address is not a market failure, but is instead a lack of resources available to purchase food. Government assistance is needed because some families, generally temporarily, do not have adequate resources to purchase enough food to sustain an active, healthy lifestyle. When they receive SNAP, participating families have more resources they can use to purchase groceries. Once the fundamental problem of resource adequacy is addressed, recipients can interact with the private market to obtain the food they need. A key reason for SNAP’s success is that it relies on the private sector to provide efficient access to food, through grocery stores and other retail outlets. The reliance of the program on the free market system has been a feature of SNAP since the beginning. With few restrictions, recipients have been able to optimize which items to purchase and from what retail stores, subject to prevailing prices and their own tastes, preferences, and nutritional needs. In my opinion, additional restrictions on SNAP purchases will undermine the effectiveness and the efficiency of the program. In particular, based on my research on SNAP and food consumption I believe that SNAP restrictions: will be difficult to structure in practice, will be inefficiently targeted, and in many cases—such as a proposed ban of the purchase of soft drinks or sweetened beverages—will be unlikely to change consumption patterns. There are better policy options for promoting healthy eating patterns, both for SNAP recipients and for all Americans. There are a few broad types of restrictions that have gained policy traction. One set involves narrowly targeting the commodities that can be purchased with SNAP, another involves restricting the purchase of unhealthy foods broadly, or sodas or sugar sweetened beverages in particular, and another proposes banning purchases of certain luxury foods. Each of these will be difficult to implement in practice because of the complexities involved in determining which items would fall under the ban. In addition, the restrictions would increase the administrative burden on private businesses, and particularly on small establishments. The complexities arise in part because of the sheer number of products that would need to be classified. Consumers have vast differences in their tastes and preferences, and the market responds by providing variety. 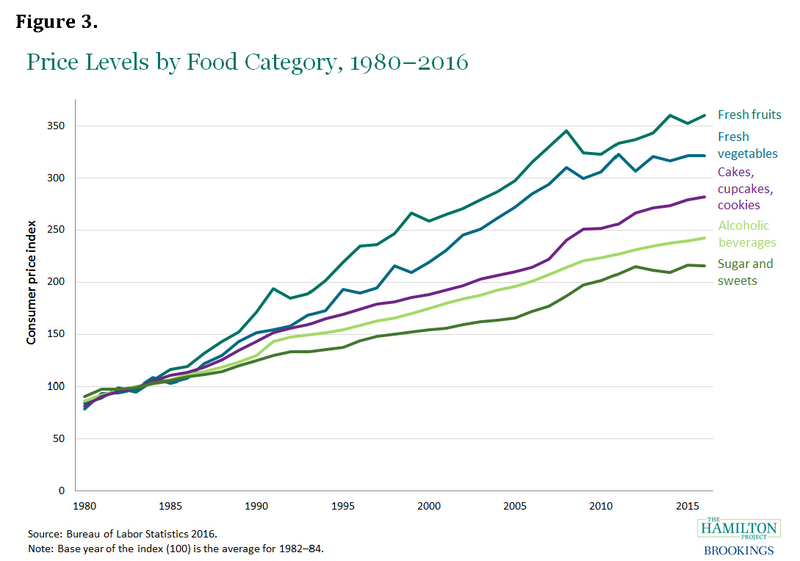 There are more than 650,000 food and beverage products on the market today, and 20,000 more are introduced annually.6 The complexity is multiplied because there is no clear standard for defining foods as “healthy” or “unhealthy,” or as luxury goods. Creating such standards would be difficult at best, and would entail substantial administrative costs to categorize and track the nutritional profile of each good to produce a SNAP-eligible foods list. The list would have to be maintained continuously and communicated to retailers and consumers in real time. My prediction is that the additional bureaucracy needed to support such an undertaking is not likely to save taxpayer money. Furthermore, items should not be classified in a manner that suggests a particular food is always “good” or “bad.” The Academy of Nutrition and Dietetics, the largest organization of food and nutrition professionals, has adopted a position statement that the “total diet” or overall pattern of food eaten should be the most important focus of healthy eating.7 All foods can fit into a healthy diet if consumed in moderation and with appropriate portion size, and as a result no particular food should be always banned. The remaining 40 cents spent on other goods, including prepared foods, cereal, rice, beans, and dairy products. Public-health advocates rightly point out that sugar-sweetened beverages are the largest source of excess calories in the average American diet, and they provide no nutritional benefit.1213 The obesity epidemic has hit Americans across all income levels, and public-health advocates are right to call attention to our excessive consumption of sugar-sweetened beverages as one probable cause.14 The USDA study indicates that this is an issue across the income distribution, and there is no need to single out SNAP recipients for their consumption of soft drinks. Among the spending observed in the USDA study, about 5 cents of each dollar went to the purchase of soft drinks. This rate is similar to non-SNAP households, which spend an average of 4 percent of their grocery dollars on soft drinks. Another option that has been proposed is to disallow only the purchase of soft drinks or sweetened beverages with SNAP benefits. These proposals exaggerate the potential impacts on consumption such bans would have, because the rationale for the bans is based on a false understanding of how SNAP benefits work. SNAP benefits are modest— approximately $4.50 per person per day—and as a result nearly all families supplement their SNAP purchases with groceries purchased from their cash income. This occurs by design, and is why the program is called the Supplemental Nutrition Assistance Program; it is intended in most cases to extend a family’s food purchasing power, not to cover 100 percent of food purchases. Estimates suggest that 70 to 80 percent of participants, perhaps even higher, supplement their SNAP spending with cash. What will happen if soft drink purchases are banned using SNAP benefits? Take a typical family that spends the average amount—$12 per month—on soft drinks, and supplements their SNAP spending with spending out of cash resources. Our best prediction is that there will be no consumption change as a result of the SNAP restriction; such a family can continue to purchase the same basket of goods, but they would have to make certain to pay for the soft drinks out of their own cash instead of their SNAP benefits. In other words, a ban will likely increase the administrative costs of the program to both the USDA and retailers, and increase the stigma faced by recipients when they use the benefits, but not have the benefit of inducing any behavioral changes. There are better policy options that are more likely to improve the diets of SNAP recipients, particularly when you consider that, over the past decade, fresh fruits and vegetables have become relatively more expensive compared to foods that are considered less healthy, as shown in figure 3 below. In response, market-based policies can increase the affordability of healthy foods and provide incentives for low-income families to purchase them. One approach that merits further consideration is the USDA’s randomized controlled trial of the Healthy Incentives Pilot in Massachusetts. This pilot program gave SNAP recipients an immediate 30-cent rebate for every dollar they spent on a narrowly defined group of fruits and vegetables.15 In response to this price rebate, consumption of the targeted healthy foods increased by 25 percent.16 In recent years, many local areas and even a few states have taken a similar approach by awarding bonus dollars for benefits used at farmers’ markets, allowing recipients to stretch their food budget farther when they buy fresh produce. To date, these programs have been successful. Exploring ways to replicate or scale these types of programs nationally would provide a more constructive and effective path forward toward achieving the goal of increasing healthy food consumption by SNAP recipients. Strengthening SNAP and reducing food insecurity in the more than 22 million U.S. households that receive nutritional assistance on a monthly basis is a smart public investment that will improve both public health and economic growth. Banning certain foods will raise the administrative burdens and cost of the program, but is unlikely to change consumption. 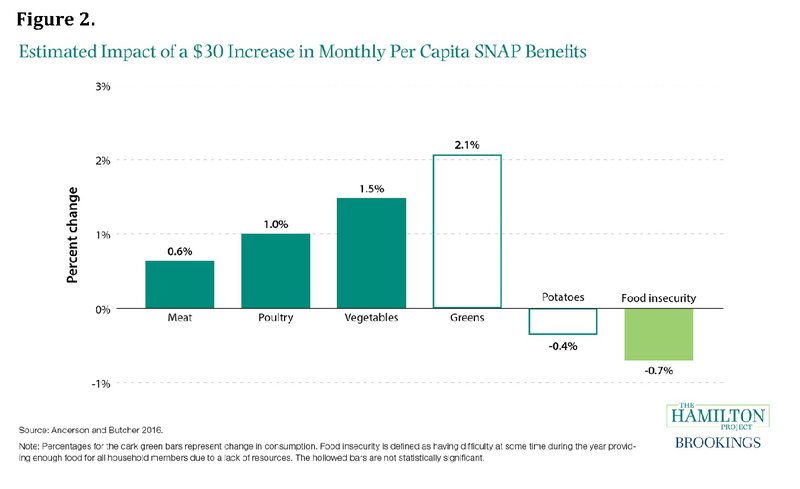 By contrast, policy changes that strengthen the purchasing power of SNAP benefits and allow markets to function without undue interference are more likely to improve dietary choices of recipients and reduce food insecurity. Thank you, and I look forward to answering any questions you might have.